« Getting Rid of Cabin Fever – Move the Cabin! Today was an exciting day full of plan changes, new territory, and fun pictures. 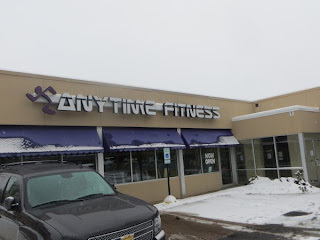 This morning I left the Walmart “campground” and had visited the Anytime Fitness in Dubuque. 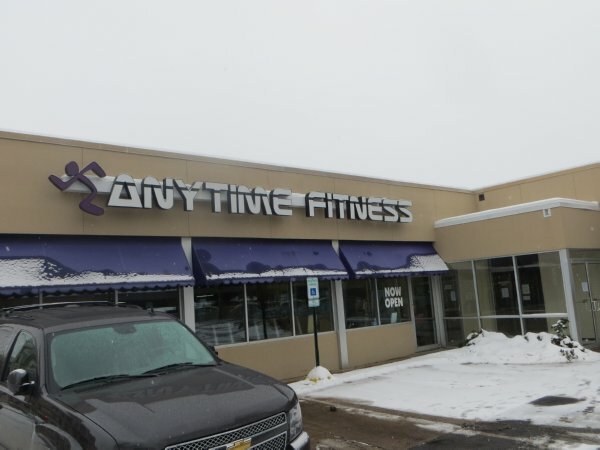 Not only was it a 5 – star facility, it beat all the other ones to date. As always, the hour of cardio flew by thanks to an hour of Matlock. TV’s on the exercise equipment are a blessing! 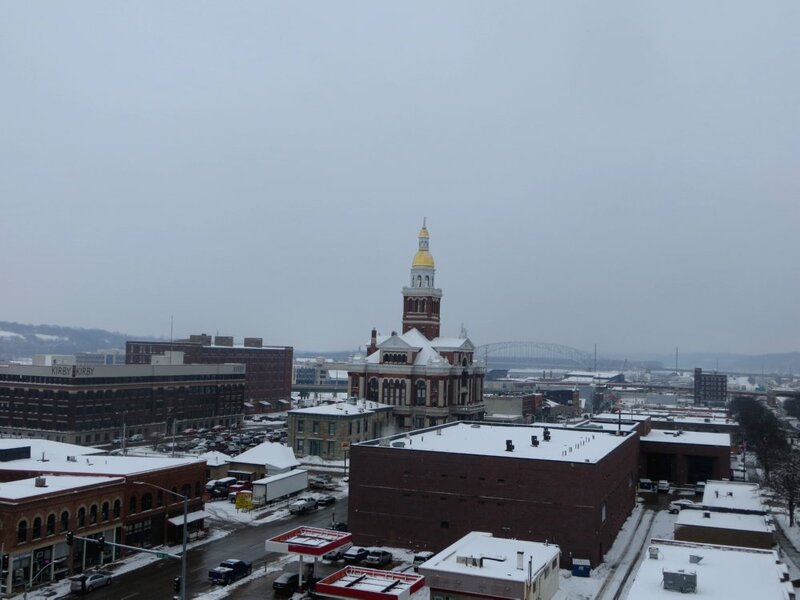 Around 10:30, I went for about a mile walk around downtown Dubuque in winter boots – a secondary workout. 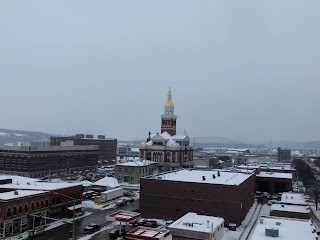 The next picture was taken from a tall parking ramp near the downtown fire department. Unfortunately, the old jail museum was closed for the season. From law and order to… well… less than honorable activity. Oh well… Crime doesn’t pay but an occasional visit to the slot machines can! Remember this TV show? A great theme for slots! I ended up at the Mystique Casino and played the “Press Your Luck” slot machines. Long story short, I came out with $154 more than I walked in with. It paid for the gas and most of the trip food. Thankfully there were few “Whammies” (the bad guys in the game). By the way, that’s not my picture. That guy is better looking. Pretty eyes, eh? Delighted with having won some trip money, I decided to pull out the stops in terms of the destination. Not going to Decorah was eating at me. That city – hopefully my home town some day – was calling… Last summer I fell in love with this area. 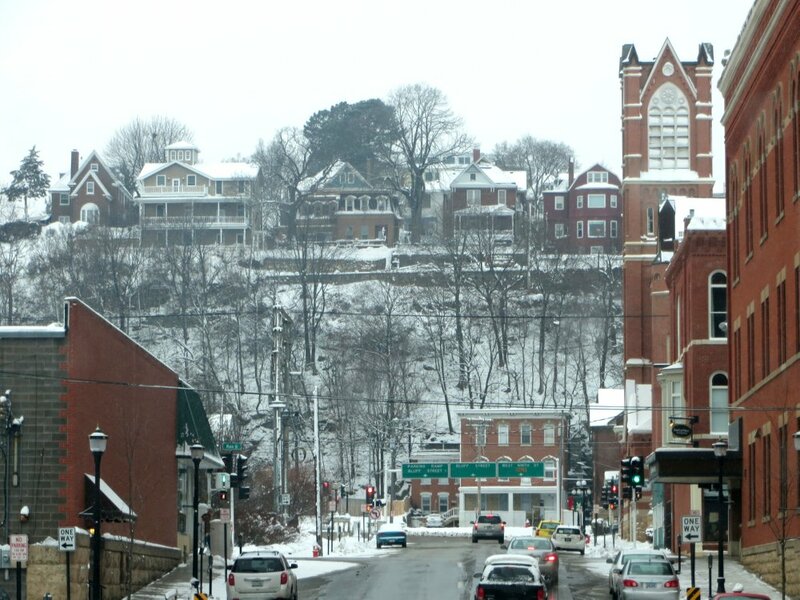 My heart is in Decorah and it feels like home to return! Despite the worsening roads (it was snowing a bit), I decided to “press my luck”, eat lunch, and head north. Lunch was at Breitbach Country Dining restaurant in Balltown, just north of Dubuque as you follow the Great River Road. It is the oldest restaurant and bar in Iowa. 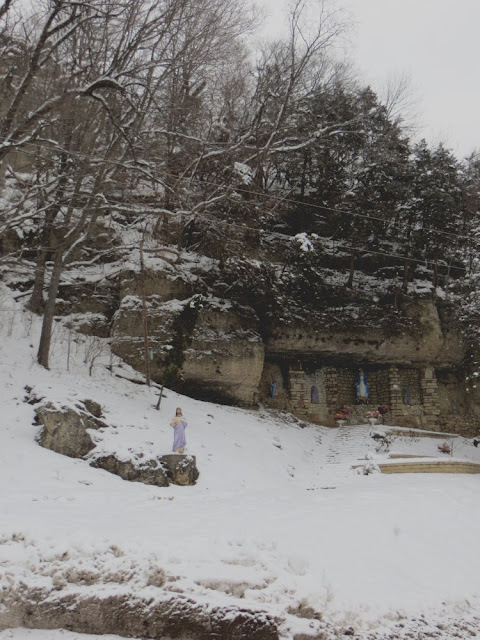 Sadly, Breitbach’s burned down about five or so years ago. After rebuilding, it burned to the ground again just 10 months later. But Breitbach’s is back bigger and better than ever. 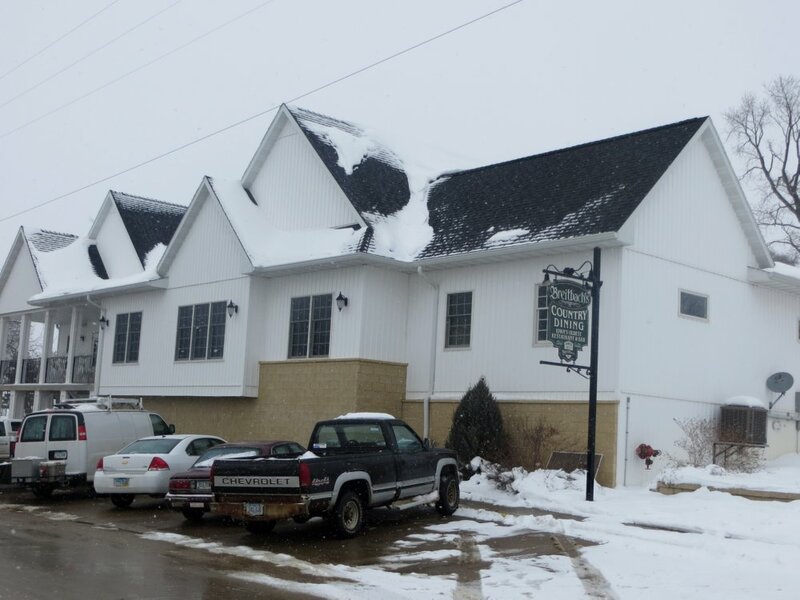 It is one of the finest restaurants in Iowa. I am giving it five stars on Yelp.com. The interior of this restaurant is breathtaking. Not only is it immacculate, the decorations are stunningly gorgeous. This is a class act. It’s not like the typical country restaurants with washboards and rusty tools on the walls. There were a number of Christmas “villages” on the shelves and the other decorations (including a collection of old style blue and white plates nicely complemented the other furnishings. The food was excellent. Everything was homemade. The fried cod, fried chicken, ham, etc. really hit the spot. A full buffet was only $10. Trust me, it was filling! This is Midwest cooking at its very best… like Grandma used to make. Breitbach’s service is awesome. 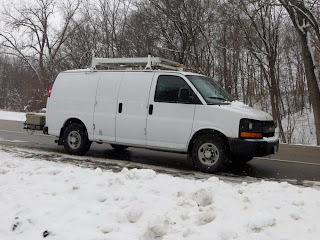 I chatted with Lynn, the waitress, and she peeked out the window at the “Trekker Van”. I explained it’s an inexpensive way to be able to go camping and sleep outdoors all the time while being employed, too. 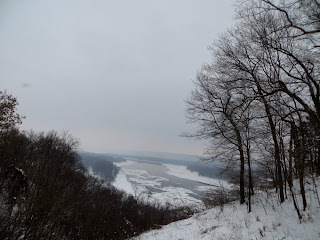 Here are some more pictures of the region as I headed north along the Great River Road. At a couple of points I was overcome with the sheer beauty all around me… enough to thank God for letting me see it all. I can’t say I heard a voice, but a feeling flooded through my body and it seemed to say (without cliches) that this is nothing compared to what beauty is yet to come. 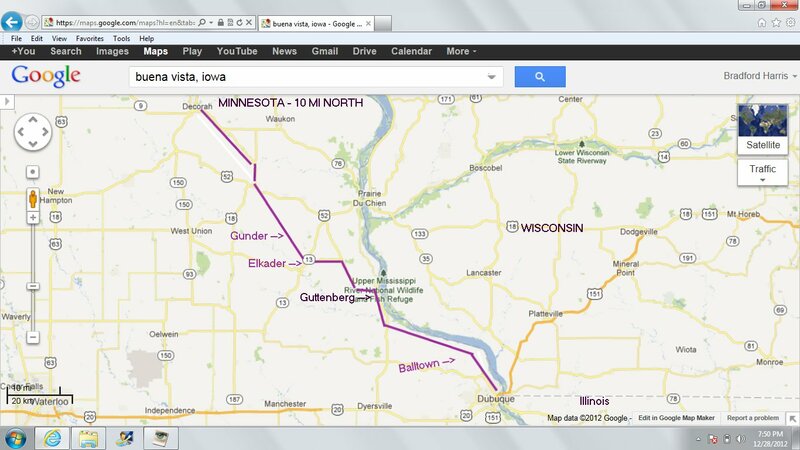 A little farther north of Guttenberg is the town of Elkader. I was here a month or so ago for a funeral. Dad and I have a cousin, Florine, who lives in town. 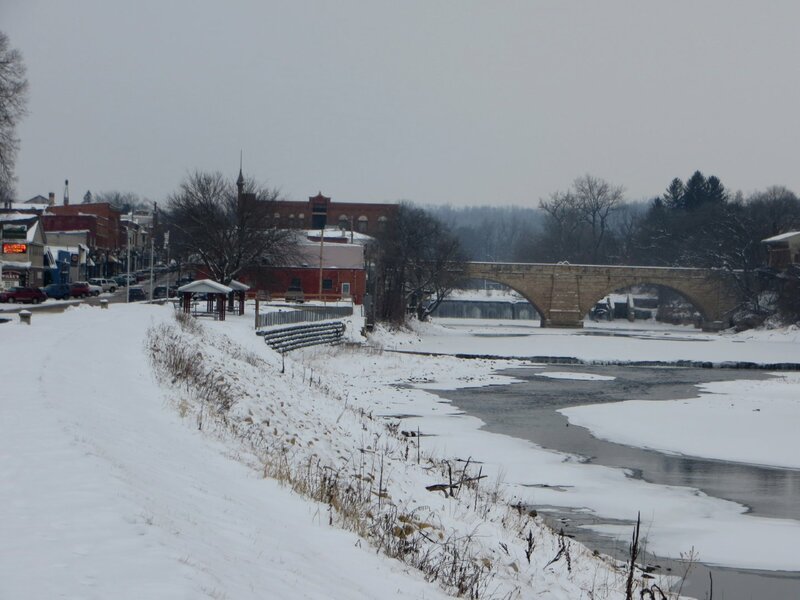 Elkader is a beautiful community along the Turkey River – a waterway that has severely damaged this region many times over the years when the spring rains came roaring through. 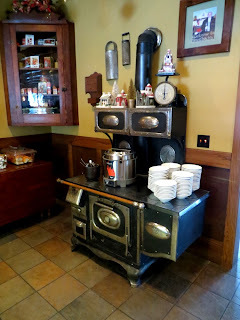 I parked at a coffee shop in town and had a cup of the most delicious Earl Grey. In fact, it was so tasty that one was purchased to go and will be warmed up for breakfast. After Elkader I headed to the small town of Gunder (about 10 miles NW of Elkader). The original plan was to have a burger and camp at the nearby trout hatchery. 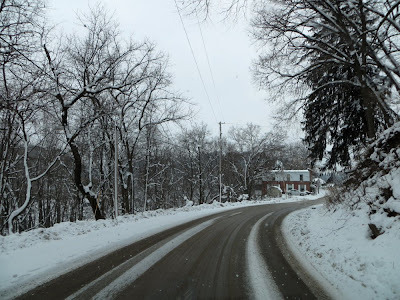 Unfortunately, the icy country roads leading toward the hatchery were in bad shape (and I didn’t want any of the 130 pound house batteries in my lap!) so I stayed on the highway and went on to Decorah… my future home some day. For now, it’s time to post these pics and head over to the Decorah Walmart for another good night’s sleep. Tomorrow I’ll put up pics of the great “Gunderburger” – a fantastic one pound (two day’s worth) hamburger that I had for dinner. It’s a local legend. If things work out, tomorrow will be spent hiking and trout fishing along the Trout Run creek in Decorah. Fresh trout would be nice for dinner tomorrow night! Take care and enjoy the winter weather. 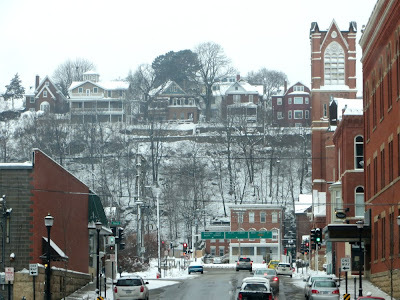 Nice photos, but chilly-looking to people like me in SoCal…have you been to Galena, Ill., near Dubuque? if not, GO!! It does look forbidding to my southern eyes, but I enjoyed reading about the beauty you saw that thrilled you. I was looking at a temperature map of the US a little while ago. It’s COLD up there! But I did appreciate the photos and the glimpse into your world. The beauty to come… what a great reminder!